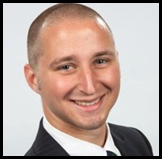 Andrew Koplitz works for Peoples Bank as the Treasury Management Business Development Officer working with new and existing business customers in providing treasury management services designed to help businesses thrive. Andrew graduated from Millersville University with a BS in Business Management and immediately climbed the banking ladder within the York area. Community activities for Andrew include serving with the United Way of York County’s Emerging Leaders Society and Allocations and Agency Review Committees. He is an Alumni of Leadership York’s 2018 Leadership Training Program and a former Finance Committee member for the Dream Wrights Community Theater.